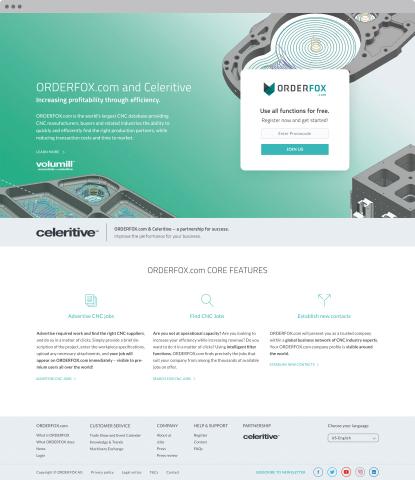 Celeritive Technologies, Inc. (Celeritive), developer of VoluMill™ and VoluTurn™, has announced the signing of a strategic partnership with ORDERFOX.com, headquartered in Ruggell, Principality of Liechtenstein. ORDERFOX.com is a free global resource platform for companies within the CNC industry in search of the right production partners, inclusive of features like Knowledge and Trends for providing information on technologies, a free Global Machinery Exchange, etc. VoluMill’s patented technology generates toolpaths that produce a consistent material removal rate. Its smooth, flowing motion establishes and maintains ideal milling conditions in any part shape. Reduced forces on the spindle and cutting tool enable machining hardware to be safely utilized to its full capabilities. With this partnership, a new subscription-based version of VoluMill – VoluMill NEXION Essentials™ will be offered to new ORDERFOX.com subscribers free for twelve months. Visit www.volumill.com/ORDERFOX-Promotion, promo code VOLUMILL02. ORDERFOX AG, headquartered in Ruggell, Principality of Liechtenstein, launched ORDERFOX.com to provide the only free global platform for companies within the industrial sector to manage digital change actively, and thus overcome the challenges of digitalization and Industry 4.0. ORDERFOX.com is the Internet of the CNC Industry, which quickly and efficiently connects CNC manufacturers, buyers and their support industries using intelligent filter functions, and therefore, significantly reduces transaction costs and time to market. Celeritive Technologies, Inc., the developer of VoluMill™ and VoluTurn™, is the world’s leading innovator of platform independent, science-based toolpaths for the manufacturing industry.